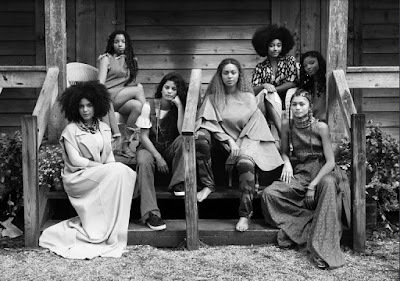 SQUAD Yonce and Crew looking at Jay Z like "I ain't Sorry"
Ok like the rest of the world or I should clarify anyone that's part of the world that appreciates any real leap by an artist to push creativity forward and change how you think about music (OK off of my high horse) ---I was literally floored this week by Bey's LEMONADE visual album. My usual take on the mega pop stars is that they can usually be a little too manufactured. I like my music independent, underground, creative and relevant. Well Yonce put that gripe to rest...for now at least. I'm not sure how she at once touched on the complexity of her marriage, the universal plight and marginalization of women of color (Hear me-- Becky with the Good Hair--I died), the complexity of issues facing African-Americans/Americans and race, motherhood, Fashion (the best revenge is looking good), Hair, the miracle of a good foundation (flawless underwater too??? give that MUA an award), the diversity of beauty, how many awesome genres of music we are culturally responsible for...I mean I could go on. IMHO it was epic. I watched it three times in a row. Then proceeded to download it the next day to watch it again. Anyway it is for that reason this crew is the Friday Face...Serena we see you too!